We recently made a visit to an off-grid village on Indonesia's Flores Island where we donated lanterns in March 2016. Approximately two years after that donation, we saw how the solar lanterns are helping the villagers' lives. Hello, this is Hal Okuda of the CSR & Citizenship Department. On January 28, 2018, just before the ceremony for the final donation of our "100 Thousand Solar Lanterns Project" in Indonesia, we visited the village of Riangbaring in eastern Flores Island where our recipient from two years ago, the Indonesia Midwives Association is active. 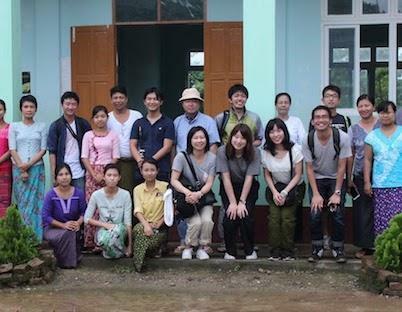 Upon arrival, the entire village came out to greet us with a welcoming ceremony. The recipient Indonesia Midwives Association is an organization that grants midwifery certification to the 448,000 midwives that are said to exist across Indonesia. Additionally, the association supports expecting mothers across the region by arranging for ambulances from neighboring towns in the event of an emergency and establishing a mutual support and information sharing system for midwives. Joria Parmin of the Indonesia Midwives Association who coordinates midwives in eastern Flores Island told us how the neonatal mortality rate has dropped now that midwives can provide adequate support under solar lantern light. Additionally, parents being able to see their child's face immediately after birth helps shape their affection toward the child, which ultimately leads to healthier child rearing. This then links to solving issues such as negligence. The solar lanterns are also being used at schools. One teacher was happy to tell us, "Thanks to the solar lanterns, we can hold supplementary classes until 7 or 8 pm. Students can receive follow up guidance before moving up a grade and their academic motivation is on the rise." Many of the villagers are farmers who support their families through the cultivation of corn and cashew nuts during the rainy season from December through March. On rainy days and in the dry season when farm work is not possible, they leave for work elsewhere, fish, or weave textiles for additional income. The village has an electrical grid but the unstable supply means that the village often goes without electricity for as much as two weeks at a time. Before they had solar lanterns, the villagers used kerosene lamps and firewood as their main sources of light. The women of the village contribute to the family income by weaving the "ikat" traditional fabrics for which eastern Flores is well known. Until now, women gathered about two times a week to weave during the day, but the solar lanterns have enabled them to work at night and this has doubled their weekly production. Women weaving Ikat designs. They work together to finish the fabric. Meanwhile, men who fish use the solar lanterns at night to repair and maintain their fishing nets. One man told us, "We can do maintenance on our nets at night, which means that we can go fishing smoother the next morning." What struck us most though was how the solar lanterns were so clean even after two years of use, and how carefully the people are using them. Some people were so careful that they used the lantern inside a plastic bag to keep it from getting dirty. The recent visit taught us how solar lanterns are helping out in different life situations. We really saw how solar lanterns are creating a "Better Life" for villagers two years after the donation. 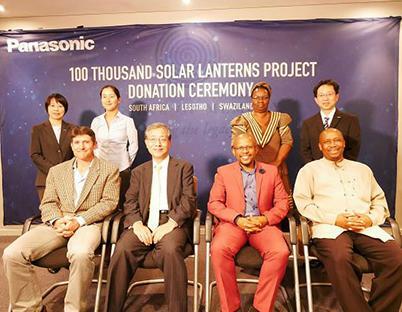 Now that we've achieved our 100,000 goal, the 100 Thousand Solar Lanterns Project will be moving onto the next phase. However, the happy faces of the villagers we recently met will continue to be a driving force for us in delivering light to people living in areas without electricity.